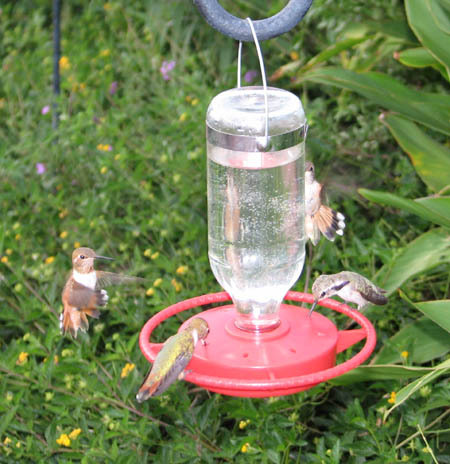 This entry was posted in birds, critical thinking, feeding, hummingbirds and tagged diabetes, hummingbirds, sugar by Sheri. Bookmark the permalink. Here’s a better and healthier recipe. One chosen and fine-tuned by hummingbirds themselves. I’d say that droves of hummingbirds returning every year, and will even tap on my windows if their feeders aren’t out in time, is testament to its efficacy and healthfulness. There’s lots of myths and legends being spread on the internet, by those who accept the first hits they get on Google as fact. When IN FACT, those are just the most popular answers voted on by lazy minds giving those answers the most hit-counts — ending-up being not the correct answers at all. Urban legends die even harder these days, they get amplified exponentially via the net. Your recipe, which contains brown sugar, is exposing the birds to a toxic element known to kill hummingbirds. Brown sugar is just white sugar with added molasses, which, as I have previously discussed on this blog, is rich in iron. A little extra iron is fine for most humans, but it can be deadly for nectar- and fruit-eating birds. The tiny quantity of dietary iron hummingbirds need comes naturally from the arthropods in their diet. When a hummingbird’s iron intake rises above natural levels, the excess iron builds up in the liver and other vital organs. Chronic iron overload such as would result from daily consumption of an iron-rich feeder solution causes a slow, painful death as the organs are damaged beyond repair. Excess iron in their liquid diet wiped out almost the entire population of captive hummingbirds at the Arizona-Sonora Desert Museum in 2001, and iron poisoning has also been recorded in a wild hummingbird found dead in a suburban area. The source of the deadly iron in the latter case is unknown, but it could have been feeder solution made with iron-rich brown, “raw,” or organic sugar. Natural hummingbird nectar, whose “recipe” has been “chosen and fine-tuned by hummingbirds themselves” over 40 million years of co-evolution, is the basis for today’s feeder solution recipe of one part refined white sugar dissolved in three to five parts good quality (iron-free) tap, well, or bottled water. Please switch back to this safe and scientific recipe and advise everyone to whom you’ve promoted your toxic concoction to do the same.